24th of March at 10 am. 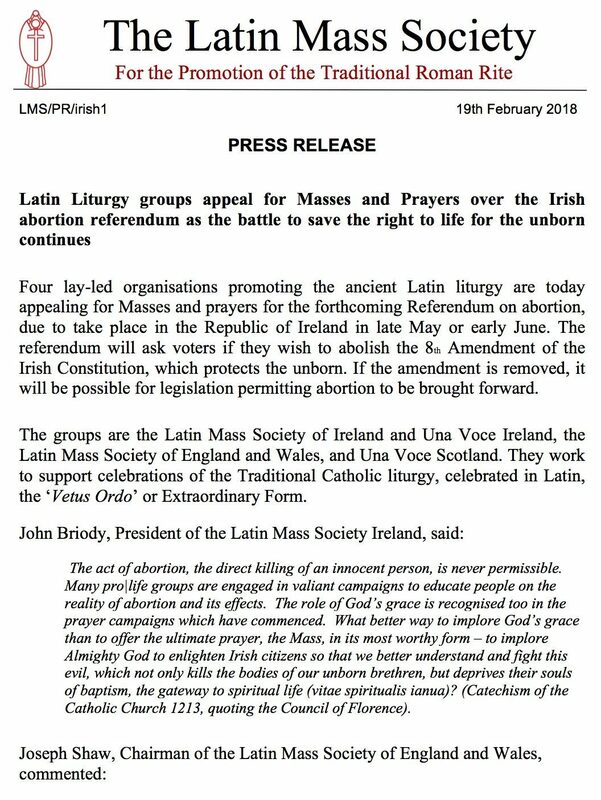 Mass will be offered for the defence of children in the womb. 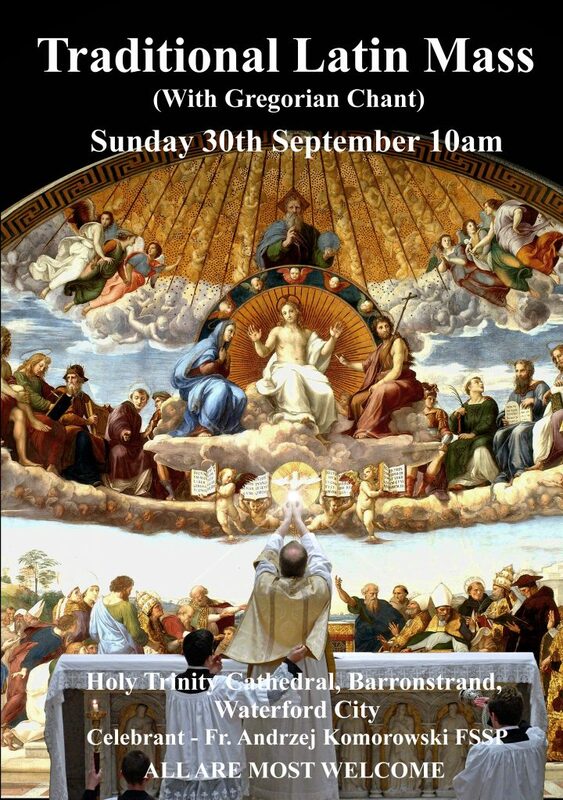 On the 1st Saturday of October at 3:00pm the Latin Mass Society of Ireland held their annual Knock Mass in the Parish Church at Knock Shrine. 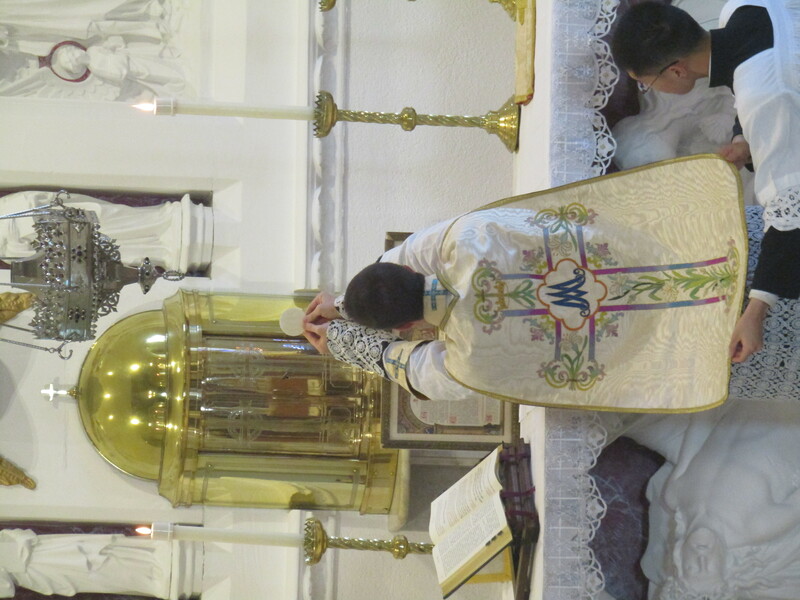 The Mass was celebrated by newly ordained Canon Benjamin Norman of the Institute of Christ the King Sovereign Priest. 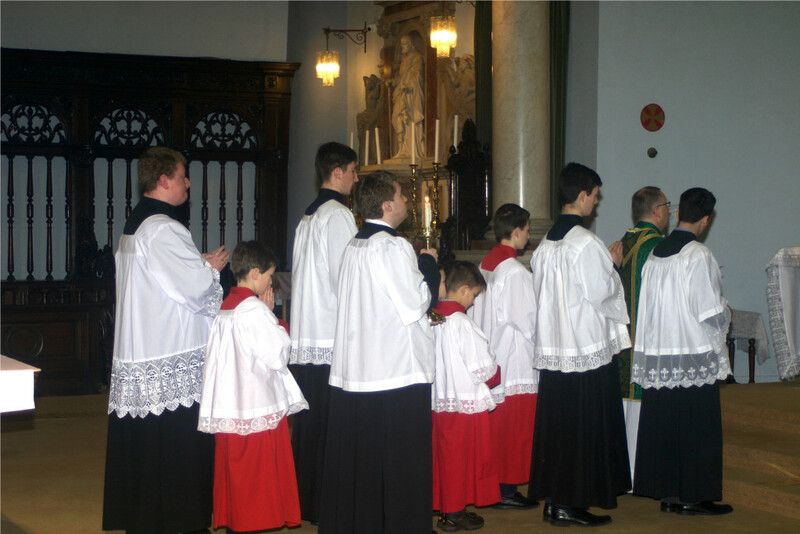 Over fifty faithful assisted at Mass and many expressed their delight and spiritual edification. It was a great privilege also to receive a first blessing from the newly ordained Canon Norman. 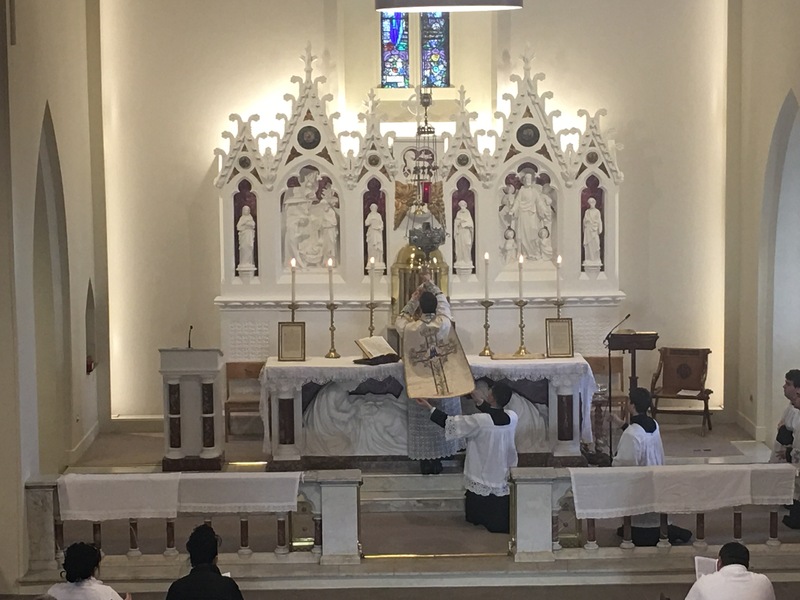 On Sunday members and friends of the Latin Mass Society of Ireland visited the beautiful St Mary Church, Claddagh Quay Galway, home to the Traditional Latin Mass celebrated every Sunday at 2:30pm. 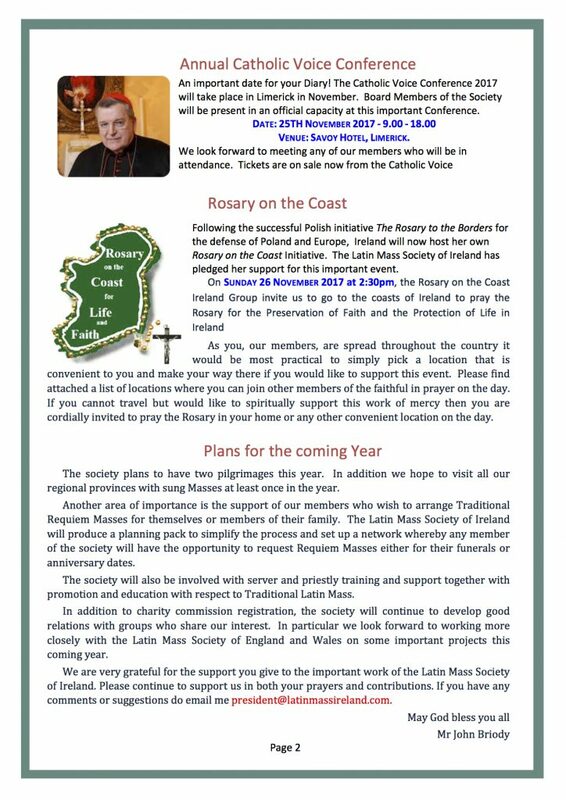 There we participated in the public recitation of the Rosary as part of the Rosary to the Coast for Life and Faith initiative and assisted at Mass celebrated by Canon Wulfran Lebocq of the Institute of Christ the King Sovereign Priest. Latin Mass Society Annual Mass at Knock Shrine. 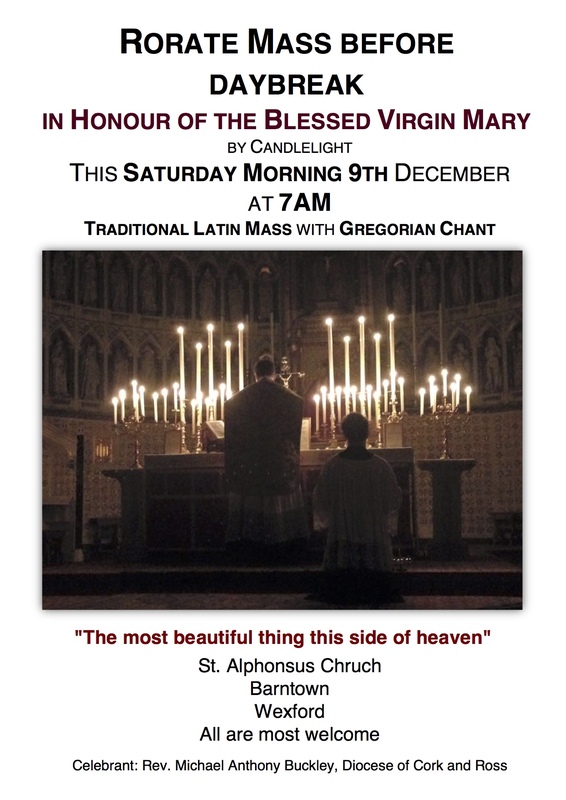 All are most welcome to join us on the day. 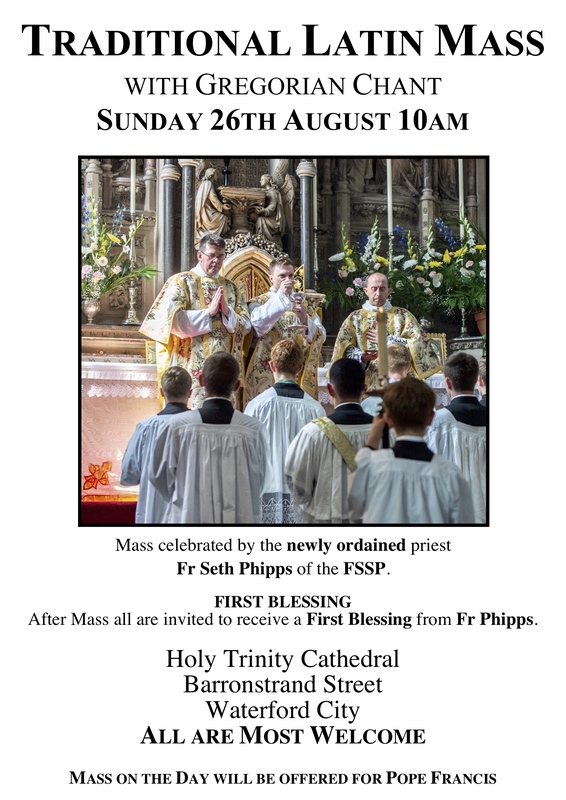 Mass will be celebrated by newly ordained priest Fr. 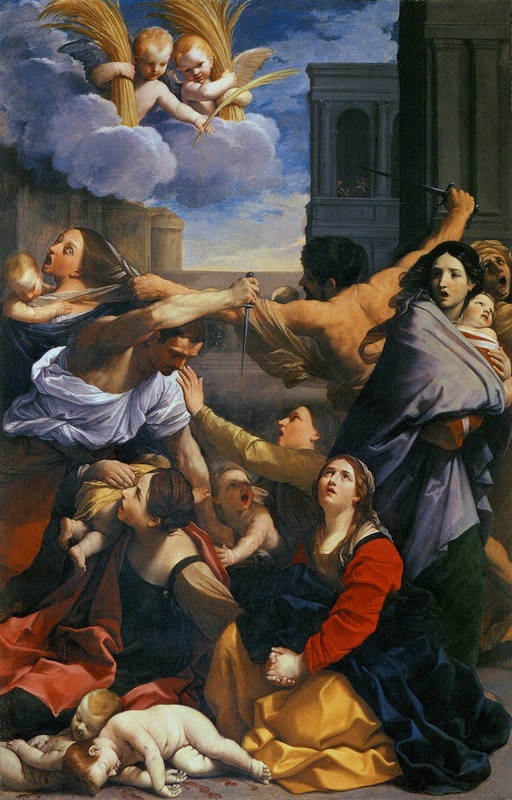 Seth Phipps (FSSP). 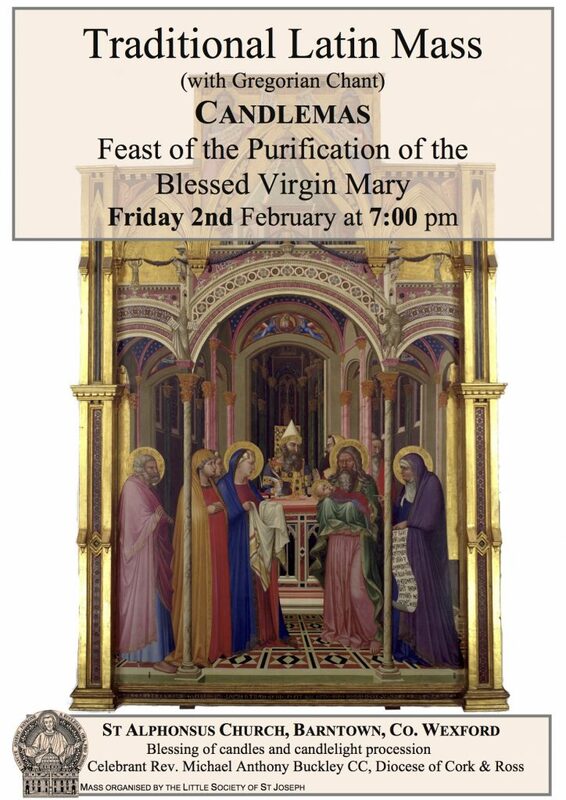 All are welcome to receive Fr. Phipps first blessing after Mass. 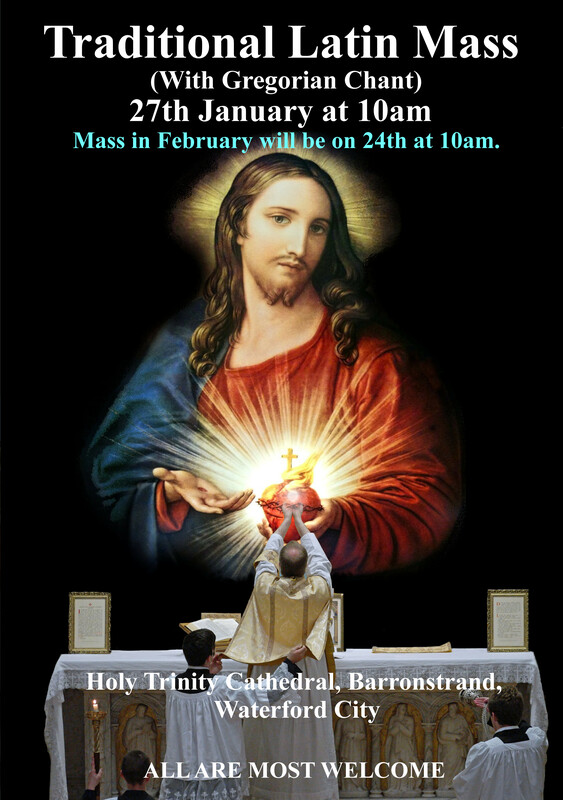 Mass on the day will be offered for Pope Francis. 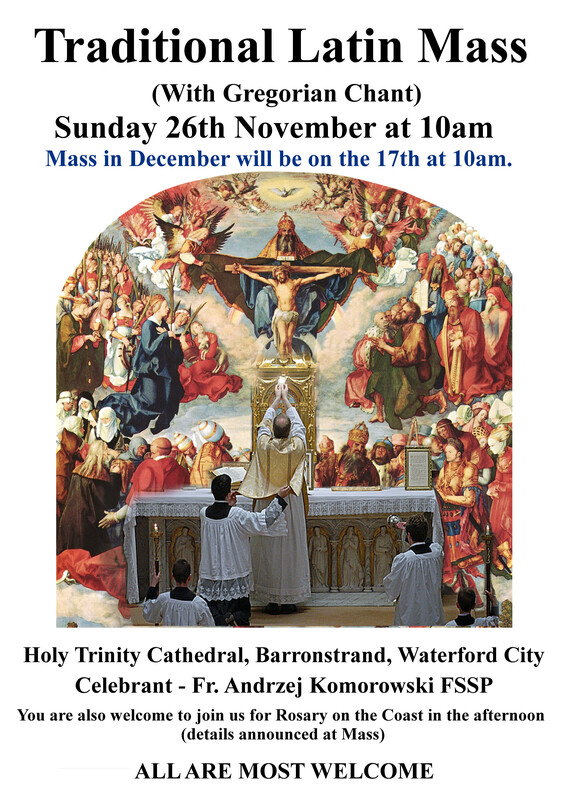 Latin Mass in St Kevin’s at 12 noon followed by a cup of tea prior to the pro-life rally on Saturday. 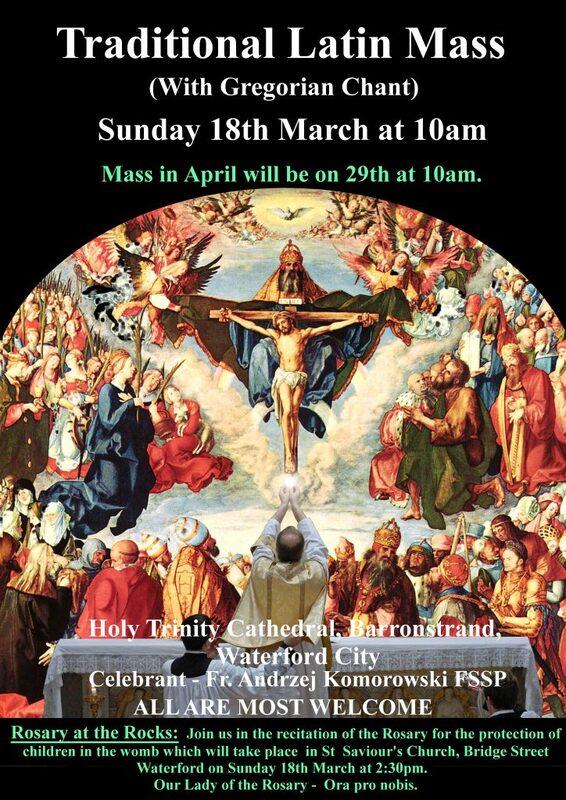 To facilitate people coming to the pro-life rally in Dublin on Saturday 10th March, there will be a low Mass in St Kevin’s at 12.00 noon. This Mass will be offered for the protection of the lives of innocent children in theirs mother womb. 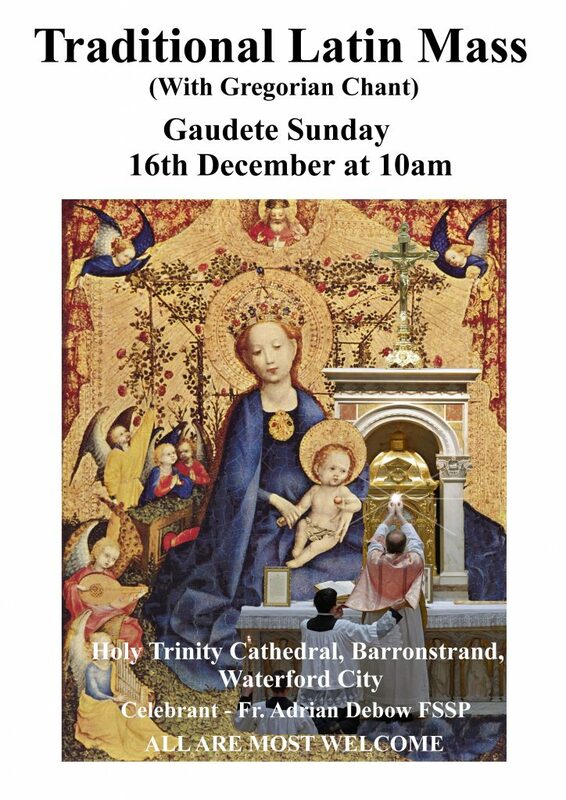 Mass on the day will be offered for the protection of innocent children in their mother’s womb from the terrible act of abortion. 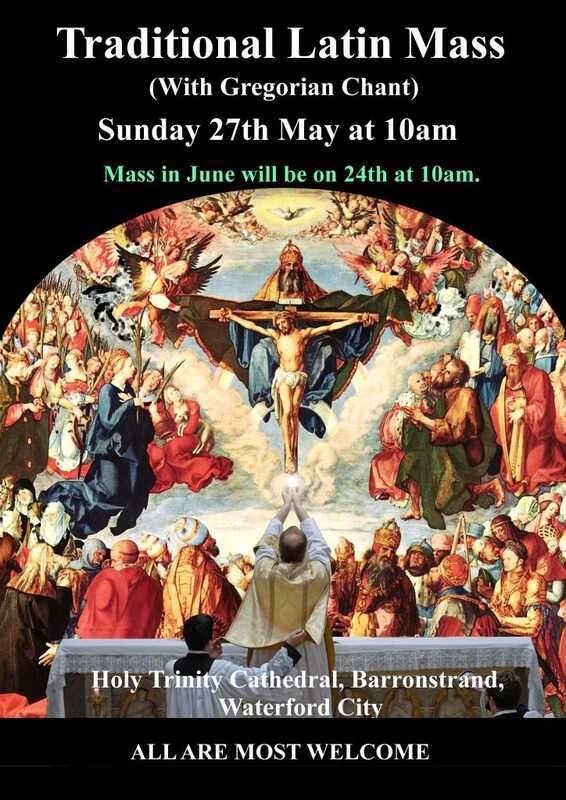 There will be a gathering as part of the Rosary at the Mass Rocks event in St Saviour’s Church, Bridge Street at 2:30 pm. 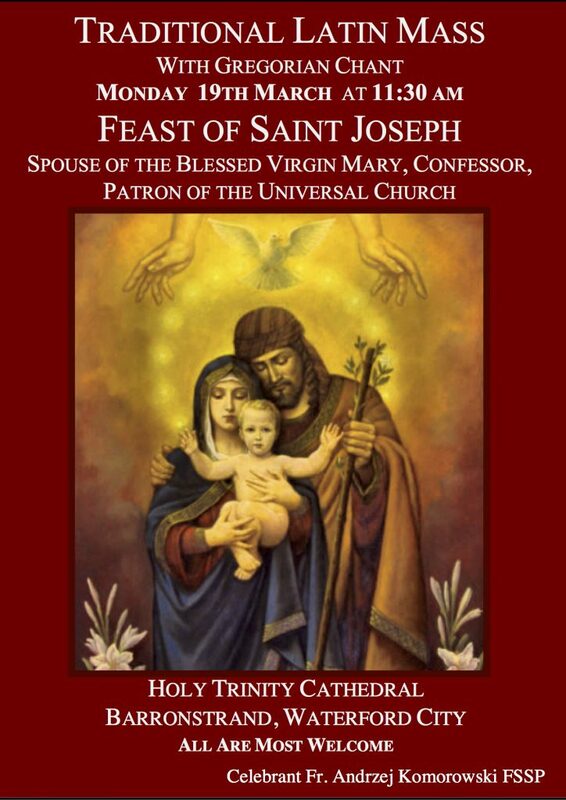 All three mysteries of the Rosary will be recited. 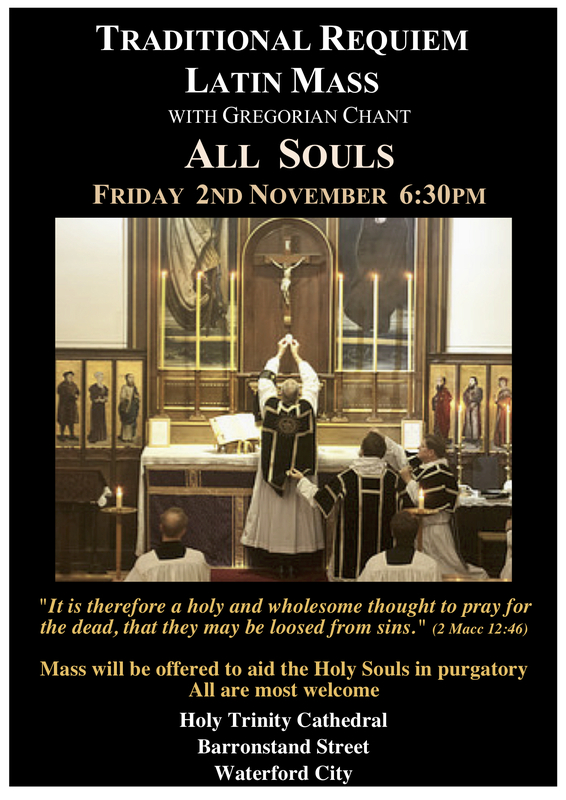 Do come and support this very necessary spiritual work of mercy. 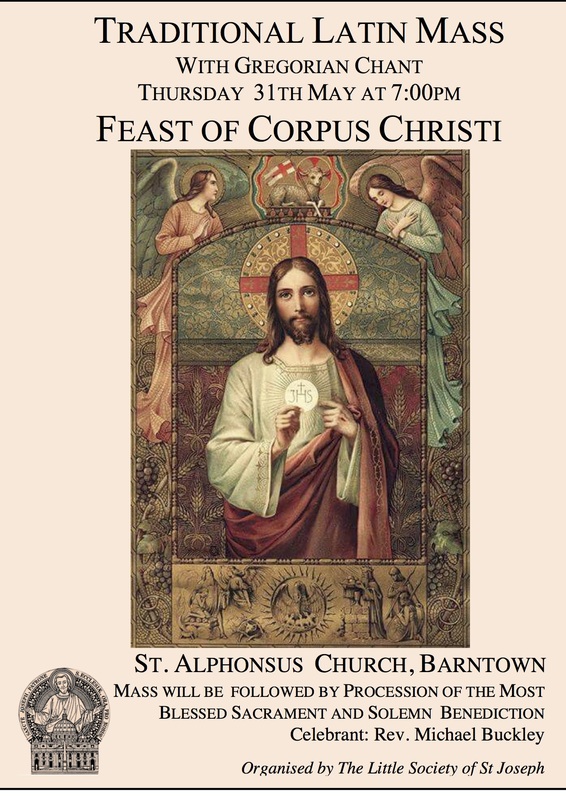 St Alphonsus Church, Barntown, at 7:00pm. 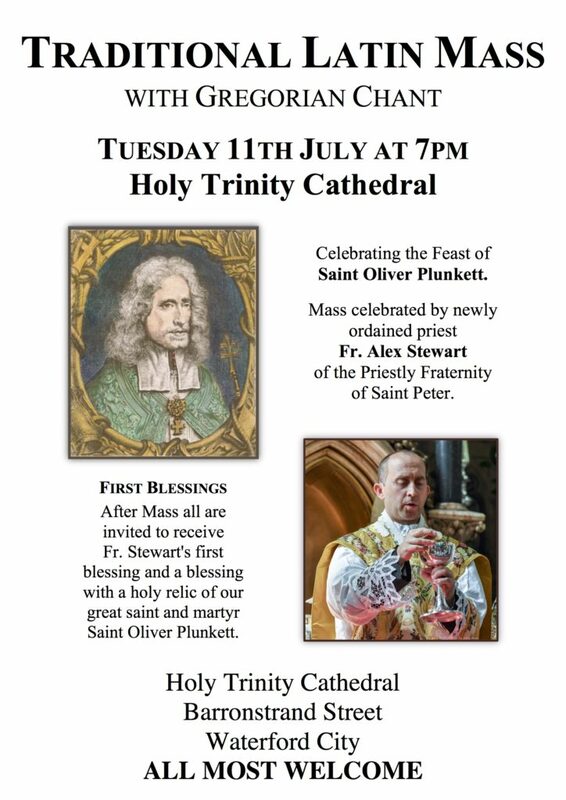 Celebrant: Fr Anthony Buckley CC. 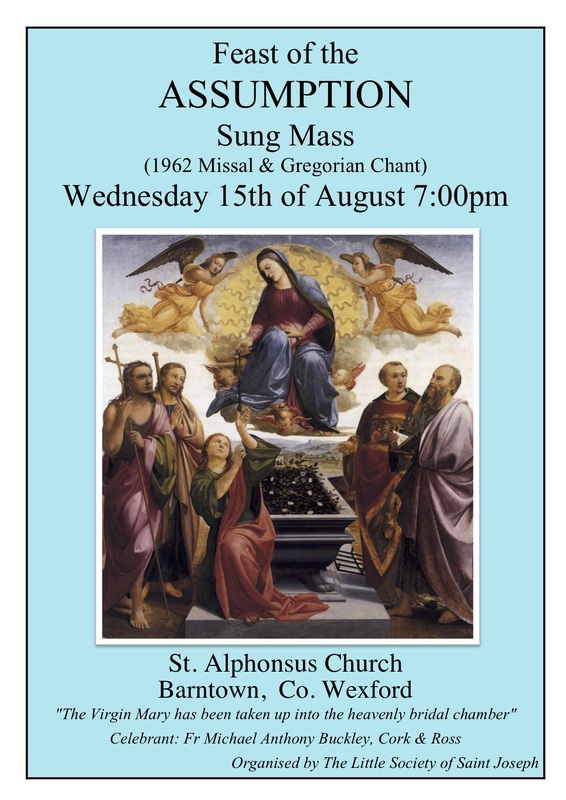 Sunday January 21st: Missa Cantata at St Alphonsus Church, Barntown, at 17:00. 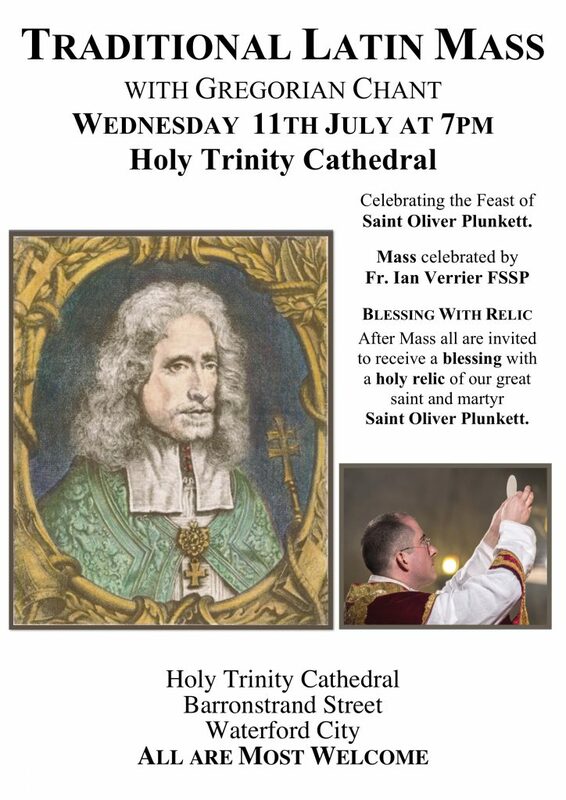 Celebrant: Fr Anthony Buckley CC. may we all have a fruitful new year. Rorate Mass at Dawn 9th December, St Alphonsus Church, Barntown County Wexford. 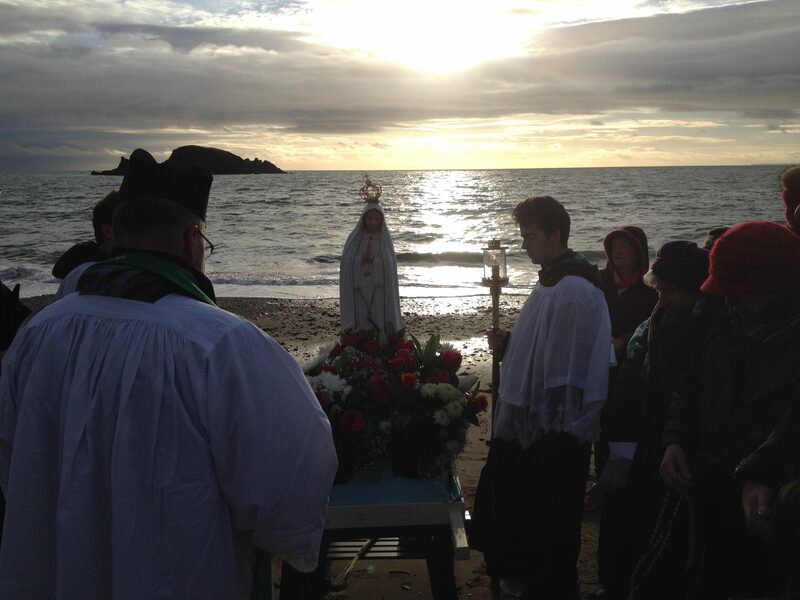 The Rosary on the Coast was a great success given the cold. About 30,000 faithful participated in the event around the country. It was announced yesterday that the Marie Stopes abortion referral clinic in Northern Ireland will be closing its doors on Friday 8th December – The Feast of the Immaculate Conception. Thank you dear Mother! 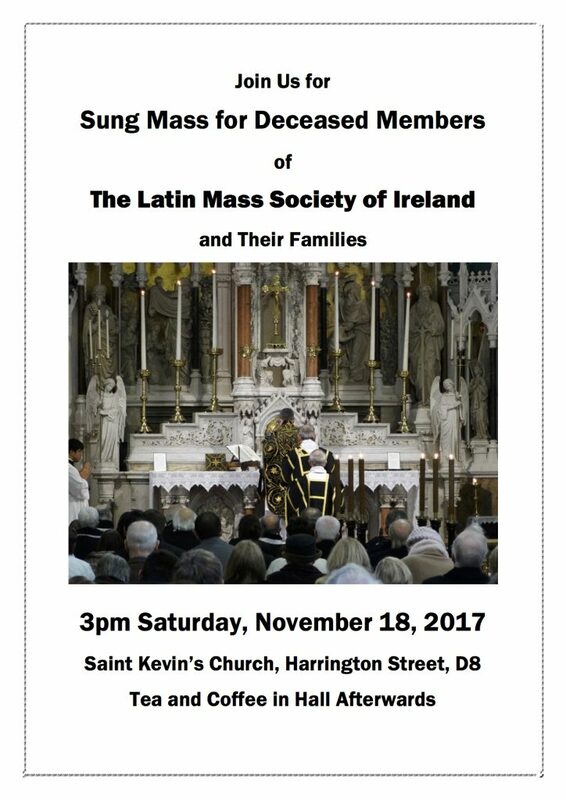 Requiem Mass for deceased members and friends. 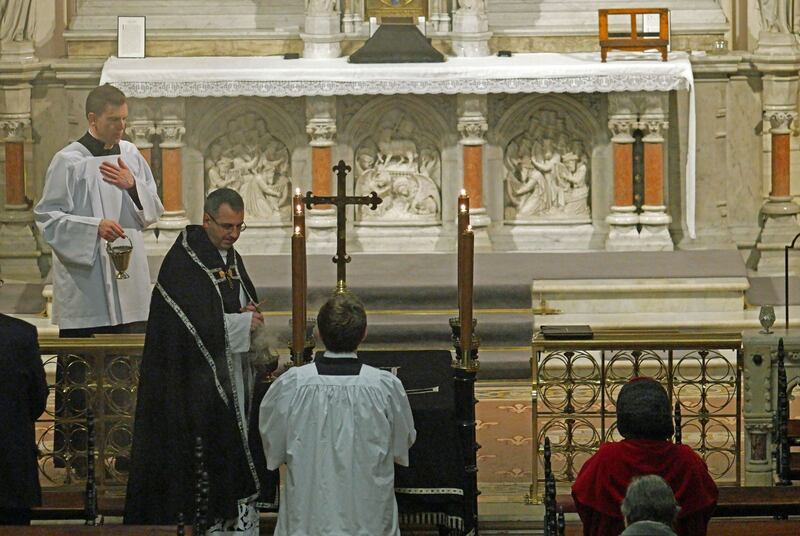 Many thanks for all who assisted at our Requiem Mass for deceased members and friends. The Society hopes to make this an annual event in November for all our supporters. Grateful thanks to Fr Deighan for making it possible. There will be Benediction and Consecration to Christ the King after Mass on Sunday 29th of October. 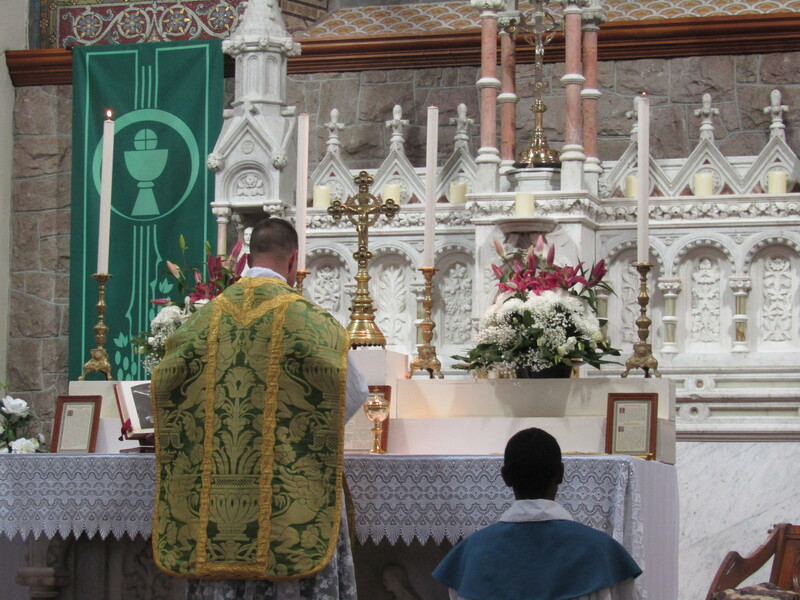 The Annual Mass at Knock for the Latin Mass Society of Ireland took place at 4:00pm in the Blessed Sacrament Chapel. 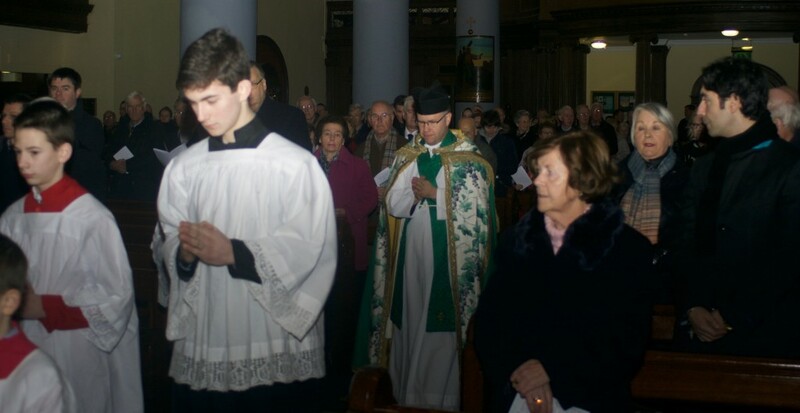 Over 60 people joined us for the Mass. 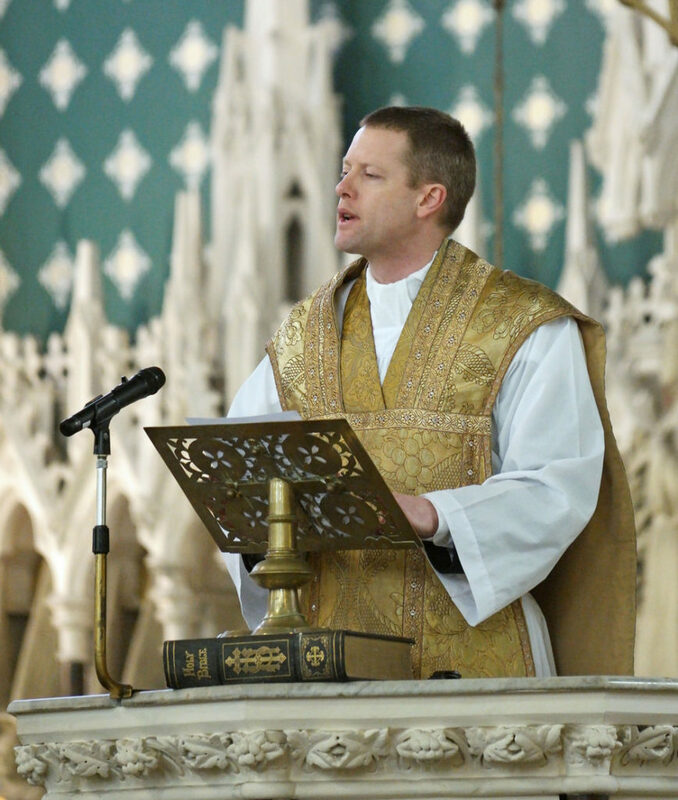 The celebrant was Canon John O’Connor ICKSP. He gave a wonderful homily on the lessons we can learn from our Lady, who even in the darkest of moments stood by the cross with confidence and resignation to God’s Will. 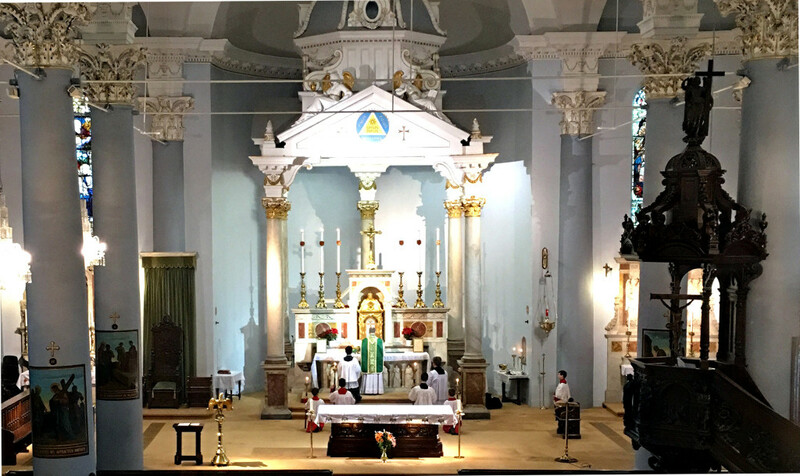 It was wonderful to have the opportunity to assist at the votive Mass of the Immaculate Heart of Mary on the day. Most especially in this important 100yr anniversary of the apparition of Our Lady at Fatima. 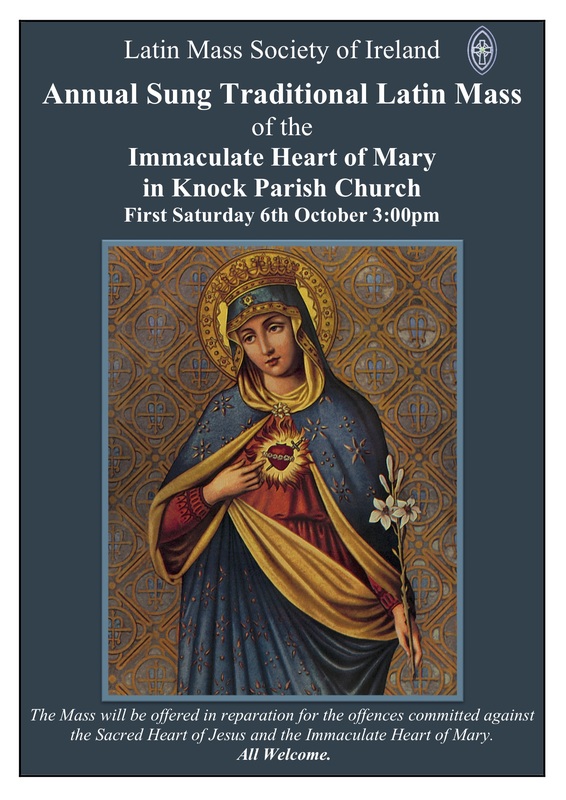 The Annual General Meeting at Knock Shrine took place on Saturday 14 October at 12 noon in St John’s Rest & Care Centre. 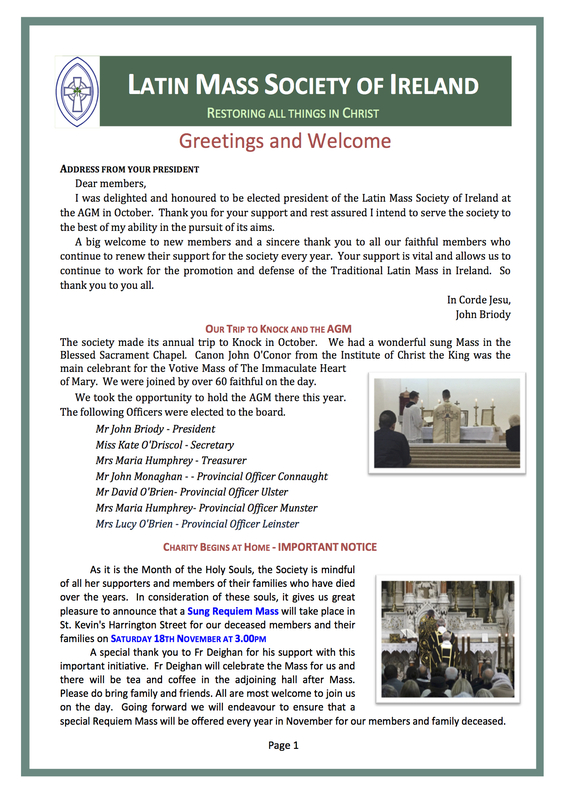 Grateful thanks to all the outgoing members of the board most especially Mr Michael O’Donovan, for his tireless service and Mr Nick Lowry a great bastion for the promotion of the Latin Mass in Ireland whose service on the board has spanned over 20 years. Also to John Scanlan for his great work and commitment in the Munster region. 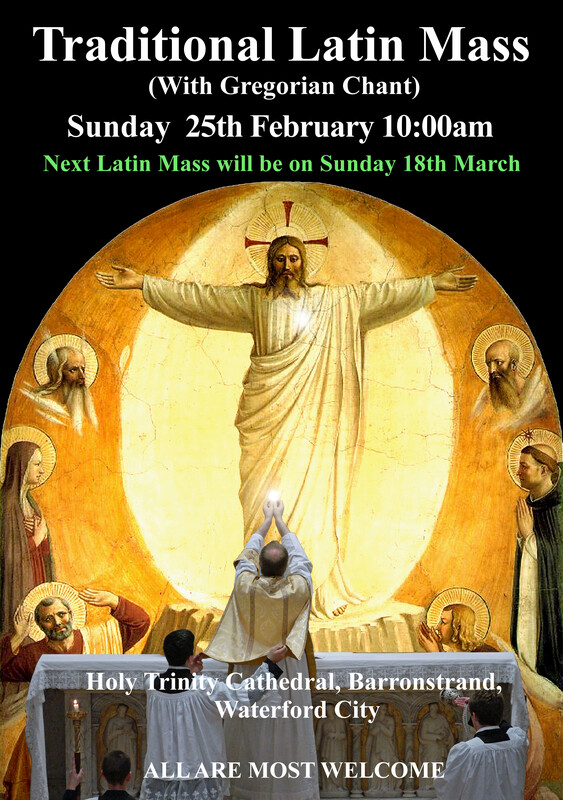 We ask for your prayers and support as we go forward in the promotion of the Traditional Latin Mass in our Country. 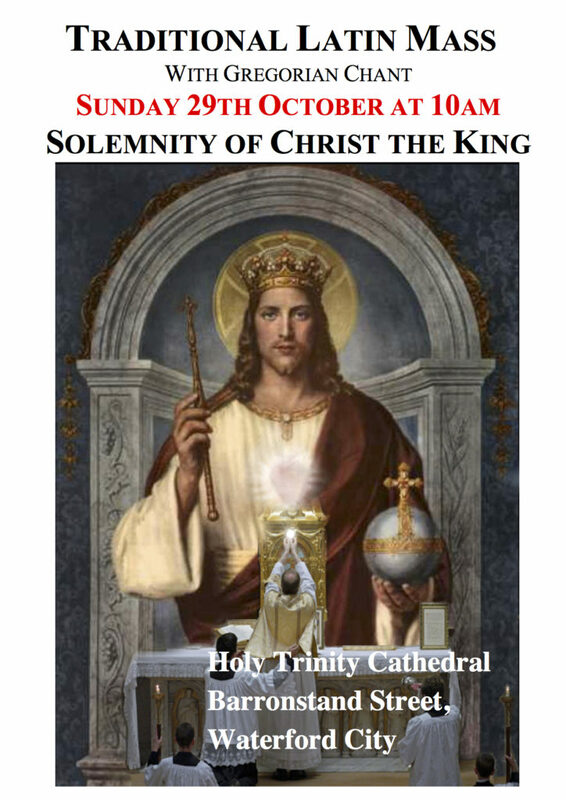 St. Colman’s Society for Catholic Liturgy is pleased to announce that the Fota X International Liturgy Conference, to be held in Cork, Ireland, 8-10 July 2017, will be opened by His Eminence Raymond Leo Cardinal Burke, Patron of the Sovereign Military and Hospitellar Order of St. John of Jerusalem, of Rhodes and of Malta. The subject of the conference is Resourcing the Prayers of the Roman LiturgyPatristic Sources and will be explored by a panel of experts drawn from the United States, Germany and Ireland, among them Prof. Manfred Hauke (Lugano), Prof. Dieter Boehler (Frankfurt), Prof. Joseph Briody (Boston), Dr. Lauren Pristas (New York), and Gregory DiPippo (New Liturgical Movement). 9.45-10.45 Joseph Briody: As He promised: Davidic Hope Resurgent – the Message of 2 Kings 25:27-30. 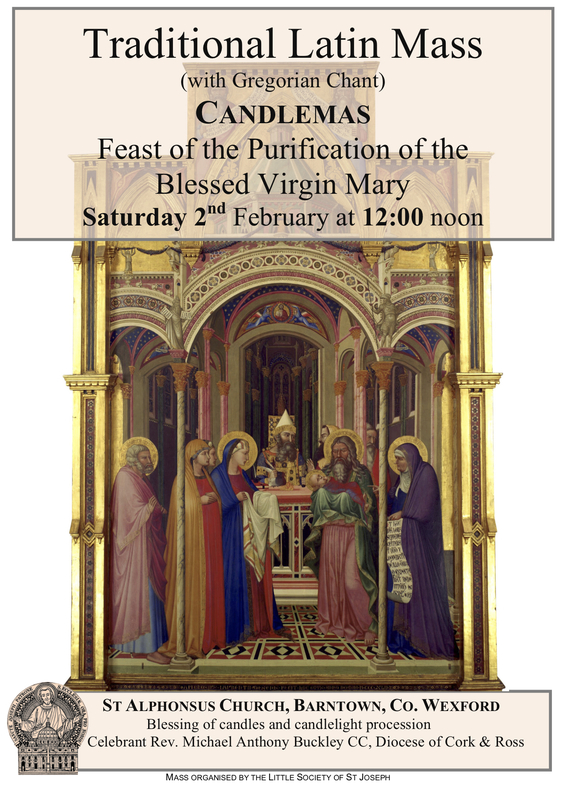 11.00-12.00 Markus Büning: Panis animarum – The Eucharist in St. Bernard of Clairvaux. 3.00-4.00 Dieter Böhler SJ: Jerome and the Recent Revision of the German Einheitsübersetzung Bible. 4.15-5.15 Gregory DiPippo: The Patristic Sources of the Roman Lectionary in Lent. 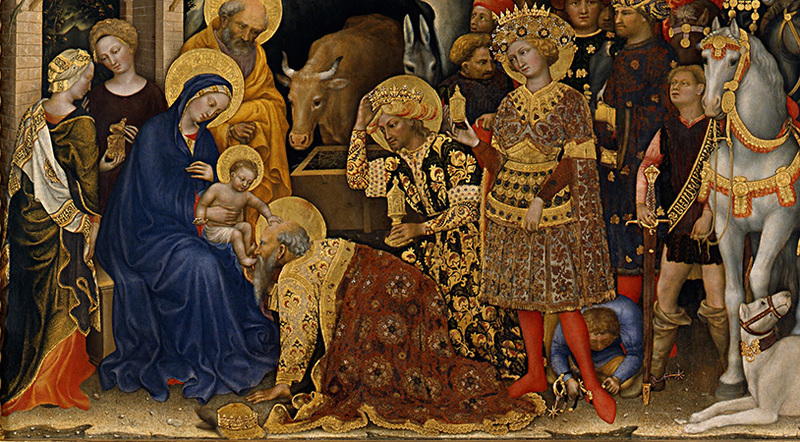 5.00-6.00 Mark Withoos: ‘ad audiendum silentium narrationis eius’ (Ep. 147): Silence and Liturgy in St. Augustine. 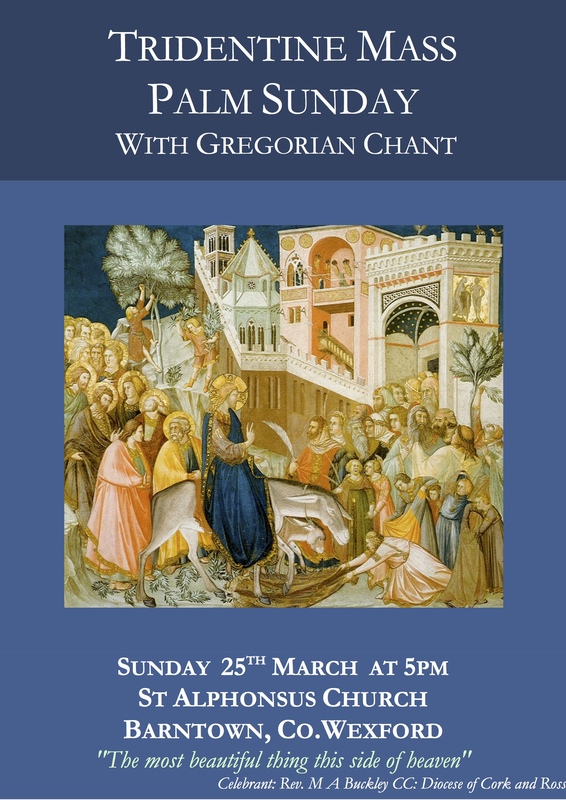 2.45-3.45 Manfred Hauke: The Holy Eucharist in the Life and Work of Pope Gregory the Great. Prospectives taking into Consideration Joseph Ratzinger`s Approach. 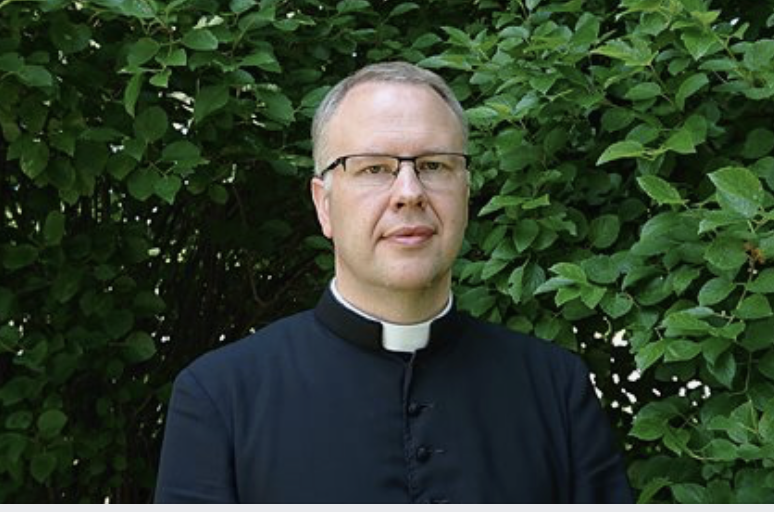 5.00-6.00 Johannes Nebel: The Paradigmatic Change of the Post Conciliar Liturgical Reform from actio to celebratio in the Light of the Latin Fathers. Early Sources of the Church’s Liturgical Discipline. Saturday 8 July 2017 at 7.30pm: Pontifical Vespers at Sts Peter and Paul’s celebrated by His Eminence Raymond Leo Cardinal Burke. Music by the Lassus Scholars Dublin: Musical Director: Dr Ite O’Donovan. 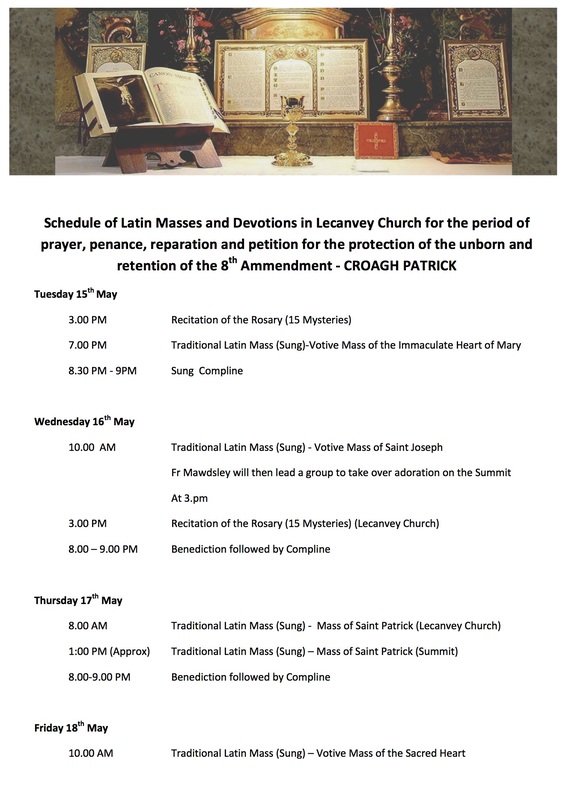 Sunday 9 July 2017 at 11.30am: Pontifical High Mass at Sts Peter and Paul’s celebrated by His Eminence Raymond Leo Cardinal Burke. . Music by the Lassus Scholars Dublin: Musical Director: Dr Ite O’Donovan. Monday 10 July 2017 at 12.30pm: Solemn High Mass in St. Peter and Paul’s. 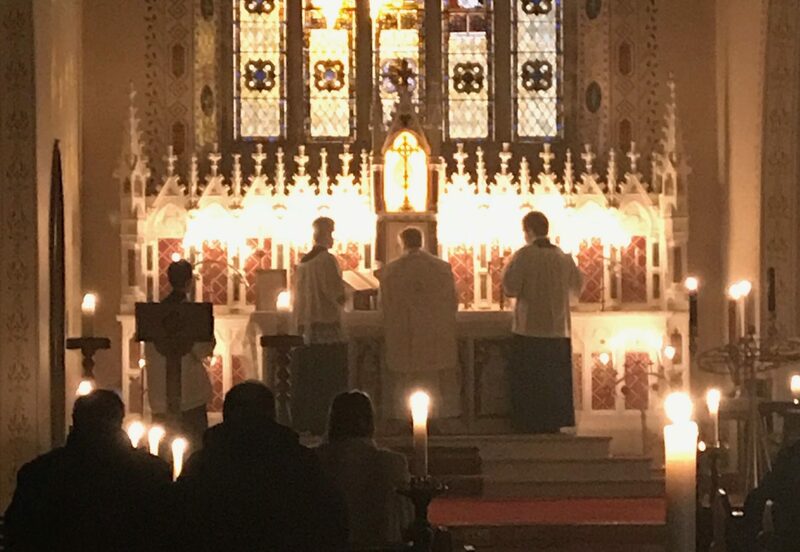 Father James Mawdsley offered his First Solemn Mass at St Kevin’s, Harrington on March 19th on the great feast of our Patron, Saint Patrick. Fr James gave a magnificent homily on the necessity of chastity to the Faith. 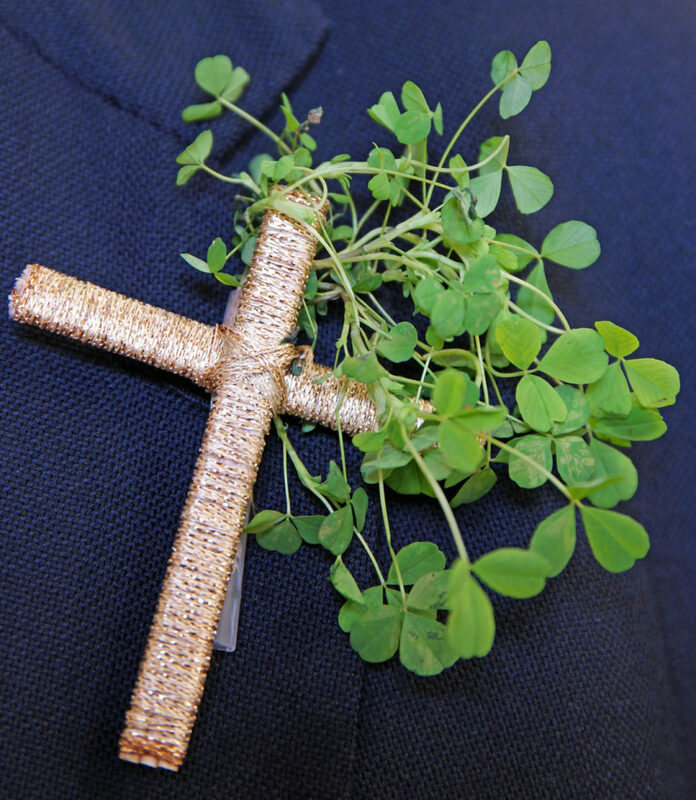 Saint Patrick, no doubt, looked down with love seeing this new soldier take up the baton and run the race. 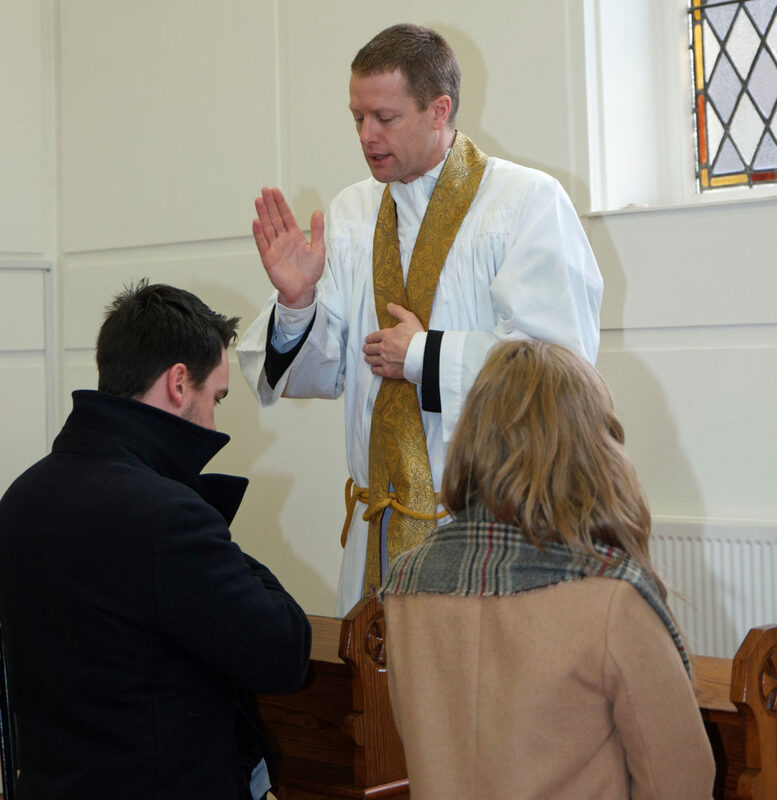 After Mass, Fr Mawdsley gave his first blessing to members of the congregation. It was a grace filled and privileged day for all. A great development for Meath and indeed the whole of our country. Congratulations to all! 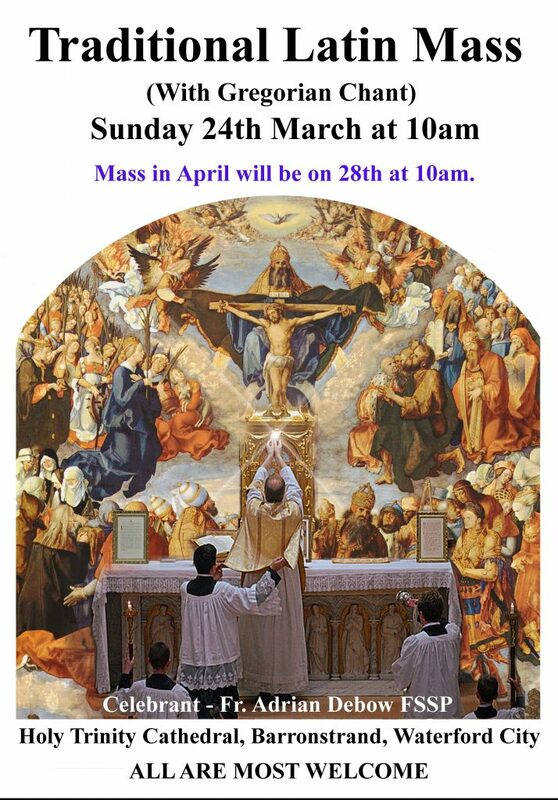 From the First Sunday in Lent, the 5th March, there will be a weekly Sunday Mass at 4 pm and all the Masses will take place in St Therese. This means that there is stability about the time and location. Having this stability of time will mean that choir membership and server numbers can grow. This will allow Sung Masses and Solemn High Masses. 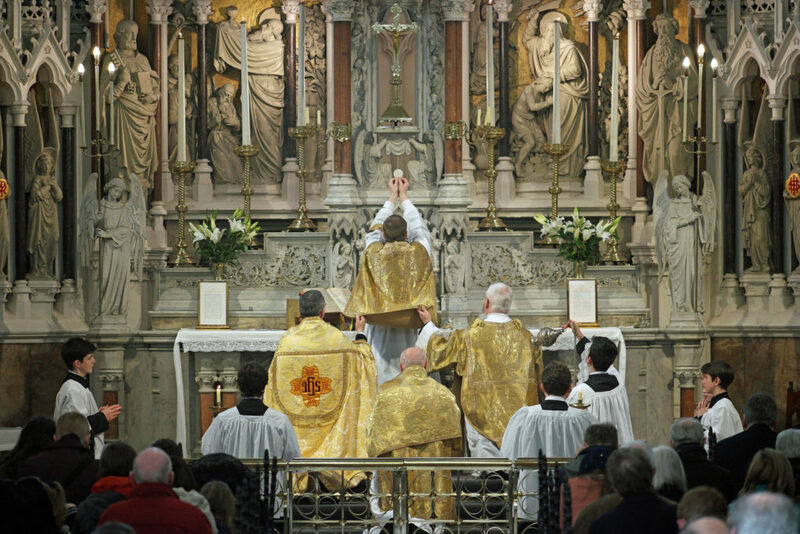 After a 50 year absence the Traditional Latin Mass returned to the oldest cathedral seat of the oldest city in Ireland. With the kind permission of Very Rev. 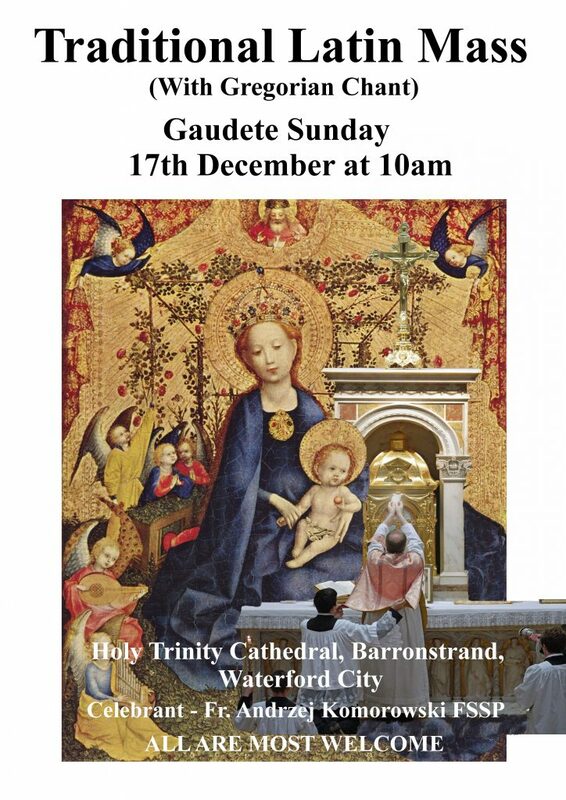 Canon Edmund Cullinan, Adm, the Traditional Roman Catholic Mass was offered in Waterford Cathedral on Sunday 22nd of January at 10am. The Celebrant, polish priest Fr Andrzej Komorowski processed in a rather fitting green cope through a respectably filled Cathedral of over 250 people, all eagarly awaiting the Traditional Mass. 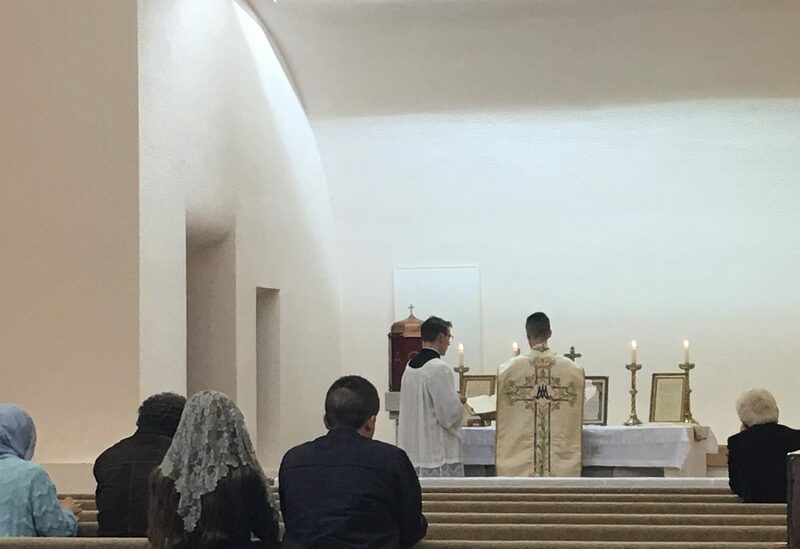 It was a wonderful opportunity for older Mass goers in the diocese to experience once again, the beauty, solemnity, and splendour of the Traditional Latin Mass. 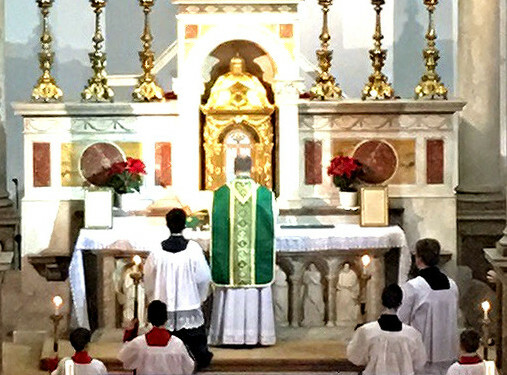 It was also an opportunity for younger Mass goers to witness for the first time, the central and most splendid jewel of their Catholic liturgical heritage – The magnificent Mass with sacred music that formed all the great saints of the Church and nourished the faith and lives of their grandparents and ancestors. 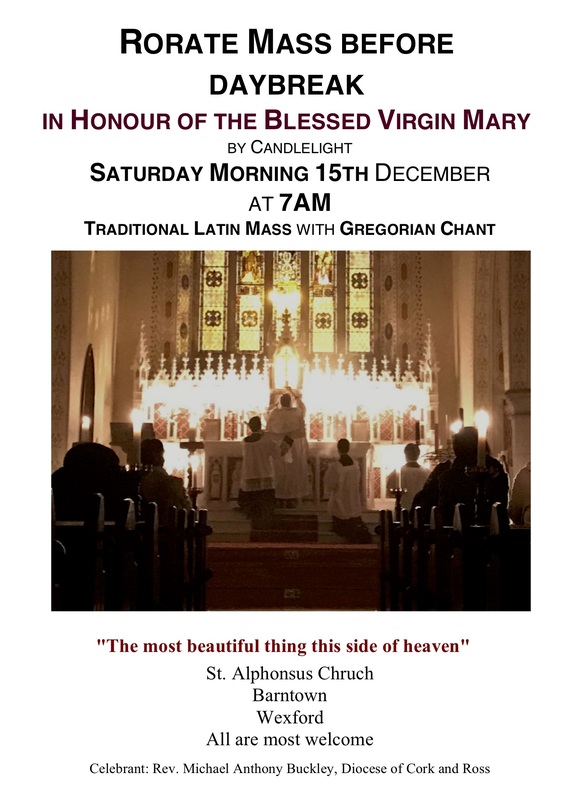 Many older Catholics remembered their chants and took up their part in the singing of the Kyrie, Gloria, Credo, Sanctus and Angus Dei. 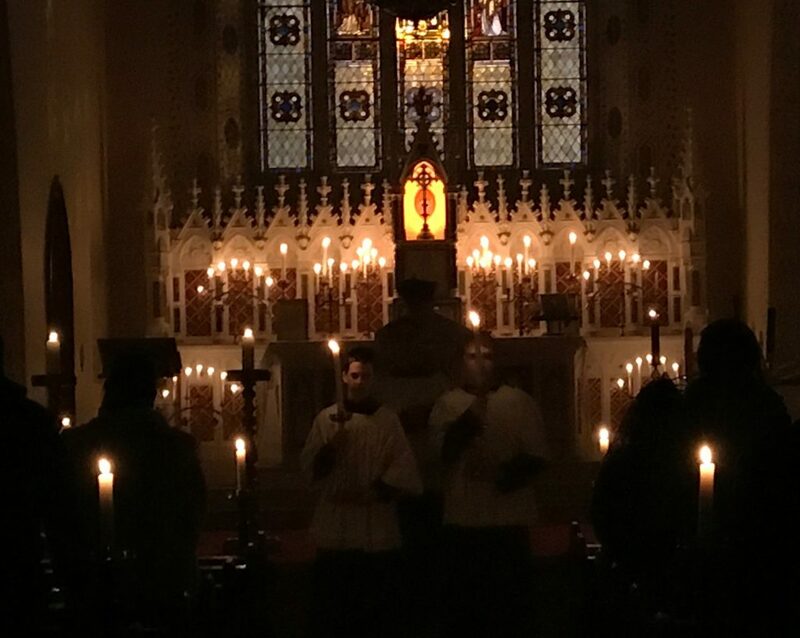 It was a great delight to all the servers when a young boy, without a moment of hesitation or insecurity presented himself to the serving team and requested to serve with them. The older form of the Mass has many fixed rules concerning the gestures of the priest. These movements and gestures reflect the sacredness of the Liturgy and provide a visual orientation to the sacred for the congregation. They point towards God in all their aspects. 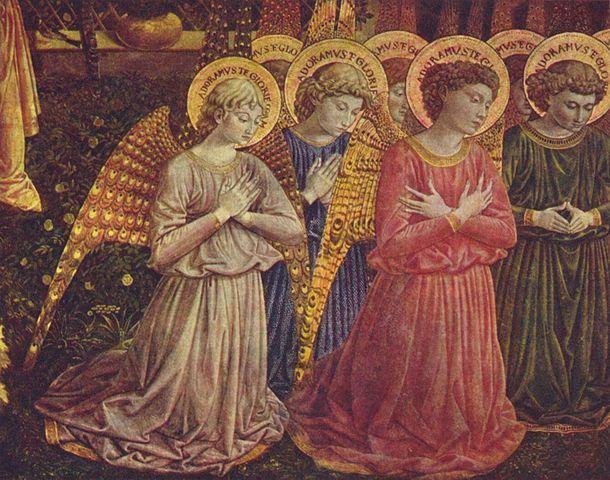 The sacred silences in the Mass underscore the transcendent nature of the Liturgy. Heaven and Earth are joined in a way that no human words can reflect. “The most beautiful thing this side of Heaven”. The Latin Mass Society of Ireland, founded in 1999, is an association of Catholic faithful dedicated to the preservation of the “ancient form of the Roman rite” as a legitimate usage of the Church’s liturgy. 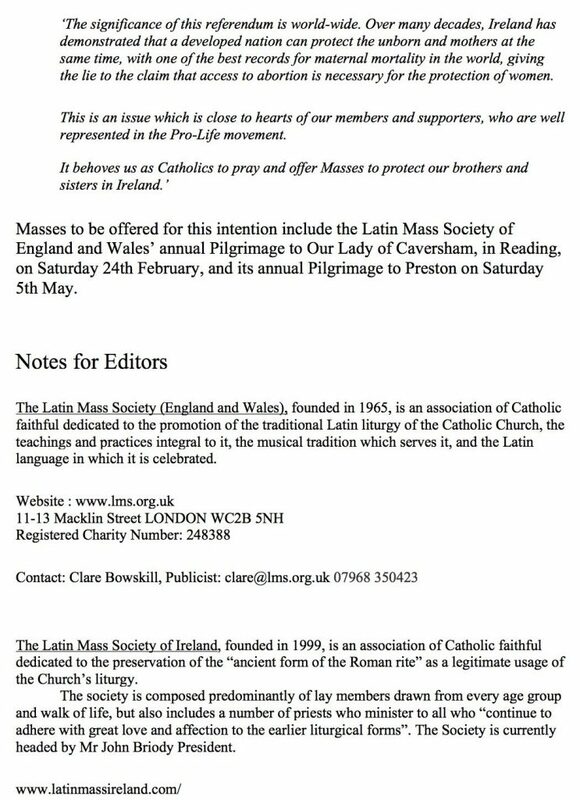 The society is composed predominantly of lay members drawn from every age group and walk of life, but also includes a number of priests who minister to all who “continue to adhere with great love and affection to the earlier liturgical forms”. 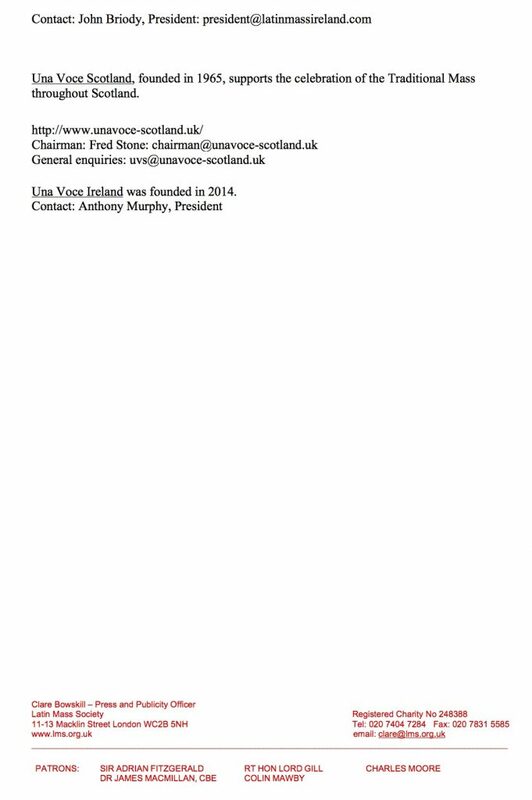 The Society is currently headed by Mr John Briody President.